Every cruise ship serves pizza. Indeed, most ships have a venue that is expressly dedicated to this universal favorite, i.e. a pizzeria. Royal Princess has two pizzerias. Prego Pizza, located near the main pool area, serves a quite decent American-style pizza like those that people have delivered so that they can munch on something while watching the game on television. Alfredo's Pizzeria is the other pizza venue on Royal Princess. 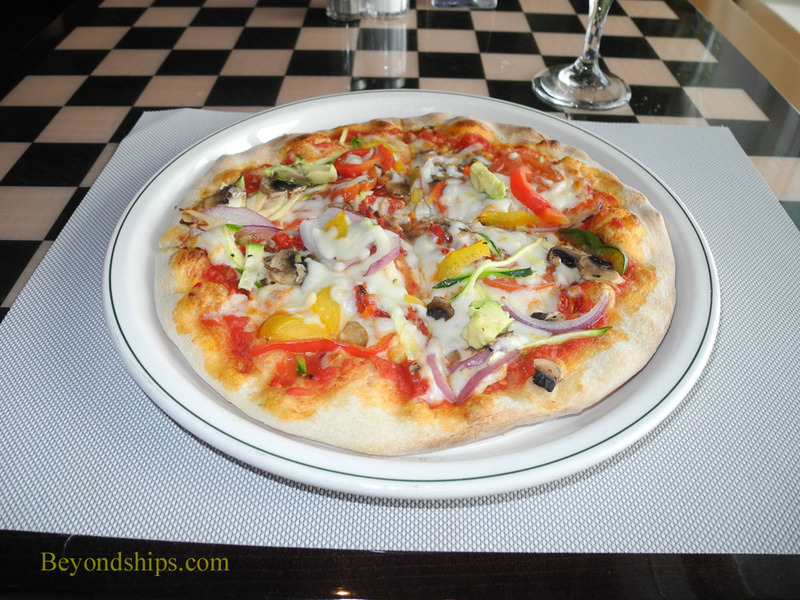 Guests often make the mistake of thinking that it is the same as Prego Pizza, just located downstairs on one the terraces overlooking the ship's lobby, the Piazza. However, Alfredo's is entirely different. To start, Alfredo's is gourmet pizza. The venue is named after Princess Cruises' master chef Alfredo Marzi. Its pizzas are based on the pizzas that he knew growing up in Italy. They are Neapolitan style, thin crust, and hand-stretched. They are authentic Italian-style pizza. The pizzas are also freshly baked to order. You do not go up to the counter and say “I'd like a slice of the pepperoni.” There are no pizzas standing by in case a customer appears. Rather, they start to make the pizza when your order is received. In fact, it is a completely different dining experience. You wait at the entrance and a member of the staff seats you at a table. You are given a menu and asked if you would like something to drink. The waiter takes your order and delivers the food to the table. We found the service to be prompt, friendly and efficient each time we visited Alfredo's. Naturally, at lunch time, it is busier than at other hours but even then the service was still good. The menu at Alfredo's is not limited to pizza. For starters, the menu offers two types of antipasto, minestrone soup, and a mixed green salad. We especially liked the green salad for its lightness. Its leafy taste complements and does not detract from the upcoming main course. The main course need not be pizza. Instead, you can have Agnolotti Grantinati alla Piemontese, pasta pockets stuffed with veal beef and parmesan cheese, or Rollata di Melanzane, an eggplant and pasta dish. We found the latter interesting but not enough to warrant passing up the pizza. There are seven different pizzas listed on the menu as well as pizza's close relative calzone. Thus, on a seven-day cruise you can have pizza at Alfredo's every day without repeating your order. Our favorite appropriately enough was the Royal Princess pizza. The ingredients include slices of parma ham, buffalo mozzarella, shaved parmesan, and tomato sauce. Fresh from the oven, each individual ingredient stood independently rather than blurring into a single mass - - a problem that can plague pizza. A surprising runner up was the Pizza Hawaiiana. The pineapple supplied a citrus taste that contrasted well with the cheese and ham. Dessert is also available - - a choice between tiramisu or an apple torte. However, while we did not feel overstuffed after the individual-sized pizzas, dessert was not really necessary. It should also be borne in mind that there are other venues on Royal Princess specializing in desserts including a gelato shop and a section of the buffet that is dedicated to pastry. Alfredo's Pizzeria did not debut on Royal Princess. 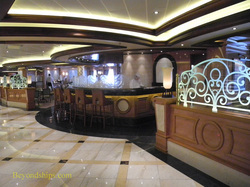 Rather, the first Alfredo's appeared on Grand Princess after her 2011 refit. (See our review). However, the Alfredo's on Royal Princess is considerably larger. It has two seating areas flanking a central working area. As above, we were pleased to find that the larger size did not adversely affect service. The décor is restrained, utilizing the light woods and pale color scheme that one often finds on Princess ships. We found the seats by the window to be the most pleasant with their views of the port of call or the passing ocean. Alfredo's Pizzeria is complimentary. It stays open from noon until midnight. Below: Insalata Mista all’ Alfredo. Above: Crostata di Mele Della Nonna.